These toys are made in the USA using great quality materials. They are all safe for your guinea pigs. 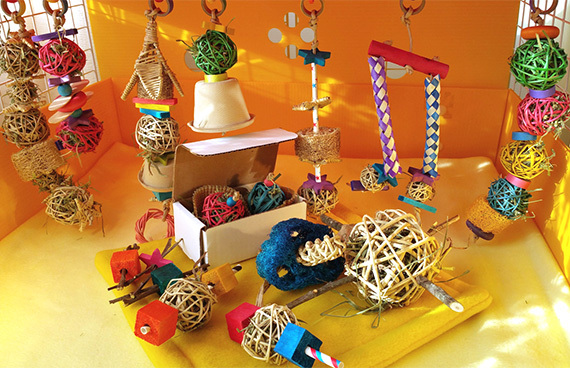 Of course, it's very easy to make your own toys and we highly suggest you do! We have some personal favorites, like hay stuffed in a paperbag! But if you are looking for some treats and want to really spoil your piggies, try a couple of these well-crafted toys. Some are intended to hang from a cage wall or top and some you can just leave around anywhere in the cage. Some piggies love playing with toys, others will ignore them. You may not know until you try. If you've got chewers, try hanging some toys in their normal chew spots and see how they do! Our Tasty Treat Bags provide a healthy and enriching activity for your furry friends! Packed with three types of fresh hay, munchable treats and sprinkled with a variety of edible herbs. Your piggies will love foraging and exploring this tasty treat. The Hay Popper makes a great toss and chew toy. It's filled with delicious, top-quality timothy hay. The Playful Playmat will provide nonstop excitement for your furry friends! With over NINE different activities, you can't go wrong! The Heavenly Harvest munch toy is stuffed with "Heavenly Green Crunch" herbal mixture and will delight your piggies tastebuds! Watch your piggies wheek with delight over these yummy Wheeker Wreaths! The perfect treat and decoration in one. Timothy Tumbler Junior Ball. 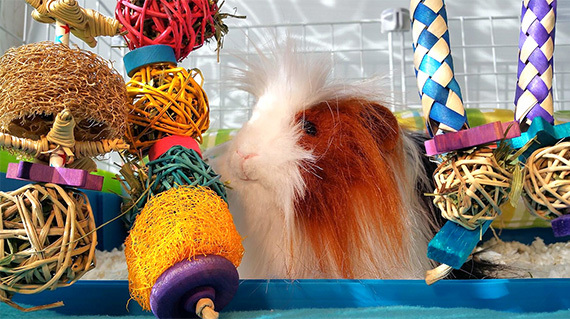 Your piggies will wheek with delight for this mini hay and apple stix filled willow ball! Timothy Tumbler Jr. Ball Made using 2" Willow ball packed full of high quality Timothy hay from Small Pet Select as well as two organic apple sticks! Features No glue! Great for rolling, tossing & foraging. Size: 3" Diameter with Apple Sticks. 2" Diameter Willow Ball. Munch The Galaxy Toy Set of 3 toss toys made with organic apple sticks!